Sounds interesting! 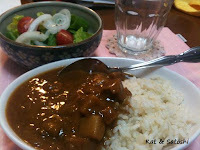 I love those curry packs, it's always great to have one on hand for lazy dinners. I bet this would be pretty good on chicken katsu. That's what we do when we have potluck for baseball. We order a large pan of katsu and make a big pot of curry. Just thinking about curry and spam together...on hot rice. Drooling. Too bad it was a little soggy though. Yes, I met your friend Jalna at the swap meet. Have you met her in person? She's so nice. She gave me a big hug. I tried to leave her a comment on her blog, but I keep getting a message saying that it failed to go through. Anyway, saw this on a menu recently, "spam katsu curry loco moco". Sounds good yeah. Too bad it wasn't very good Kat! This seems like something I would love. I actually tried spam probably 3 times. :D I need to really see what's like as I don't remember much. 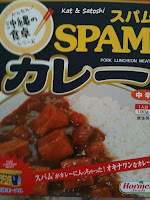 I think Japanese products are convenient and tastes good most of the time, but I worry about the quality of it... Too bad spam didn't taste right.